We have divided our models into two levels. In the gene level, we aimed to gain an insight of the gene expression dynamics of our entire circuit via using hypoxia inducible promoters and hypoxia response elements. We also expected to gain knowledge about how our designed promoter works, which includes sensitive parts which are HRE and NFKβ for ROS and O2 respectively. These parts will work under hypoxic and normoxic conditions during ischemia and reperfusion. We also tried to characterize our parts further and analyze the experimental data. In the protein level, we proposed the multi-compartment model to analyze the changes of SOD, GPX and aprotinin levels which are the antioxidant enzymes able to degrade ROS present in the cells. On the other hand, we tried to calculate the level of tPA transported from the endothelial cell to blood during hypoxia. By using two separate sensitive promoter systems, we aimed to regulate the release of tPA synthesized by our engineered endothelial cell. Firstly, we built a model to help us understand the gene expression dynamics of the whole circuit. In our promoter design, we added hypoxia response element to the upstream of our effector protein gene. In hypoxic conditions, HIF1-α protein levels are high enough to translocate it into the nucleus and form a transcriptional complex with the HIF1-β. We decided not to include a separate step for the dimerization and binding processes to hypoxia response element (HRE). 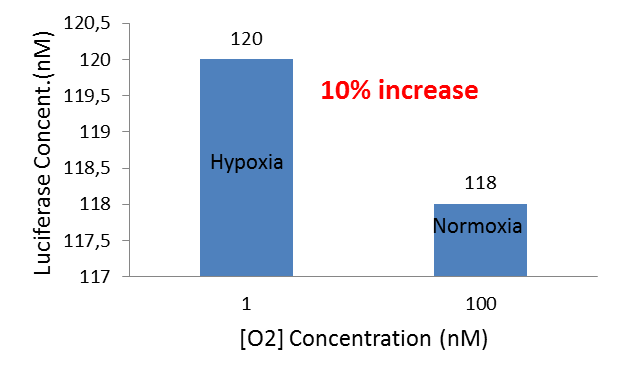 We assumed the HIF1-α level as a constant in hypoxia which does not change dynamically. HIF1-α/ HIF1-β complex can bind to HRE which then activates the transcription of our gene interest. These are tPA, SOD, GPX, aprotinin or luciferase. In addition, CMV promoter has a leaky luciferase expression without HIF1-α. Therefore, we assumed that luciferase expression from HRE + CMV + Luciferase without HIF1-α is equal to the expression of CMV + Luciferase in the normoxic condition. These are the four chemical reactions which represent each process. Finally, we assigned each process with a reaction rate constant. Using the SimBiology toolbox for Matlab, we designed a framework of the hypoxia inducible promoter system (Figure 1). The processes of binding, dissociation of transcription factor, expression of luciferase in hypoxic/normoxic conditions, and the degradation of luciferase were included in framework. 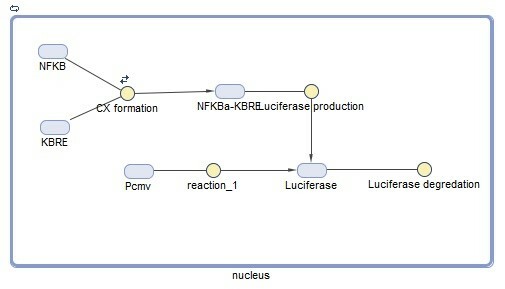 Figure1: The diagram of reactions was designed in the SimBiology toolbox for MATLAB. After designing the basic framework of our model, we were required to establish mathematical equations for each reaction withan appropriate rate constants. 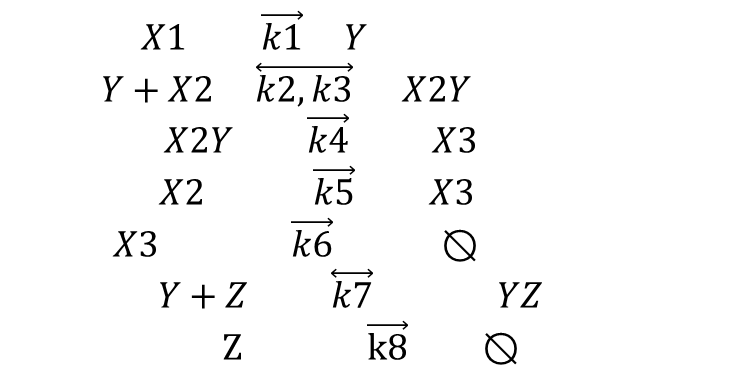 These equations and the corresponding values are shown below in Tables 1 and 2. 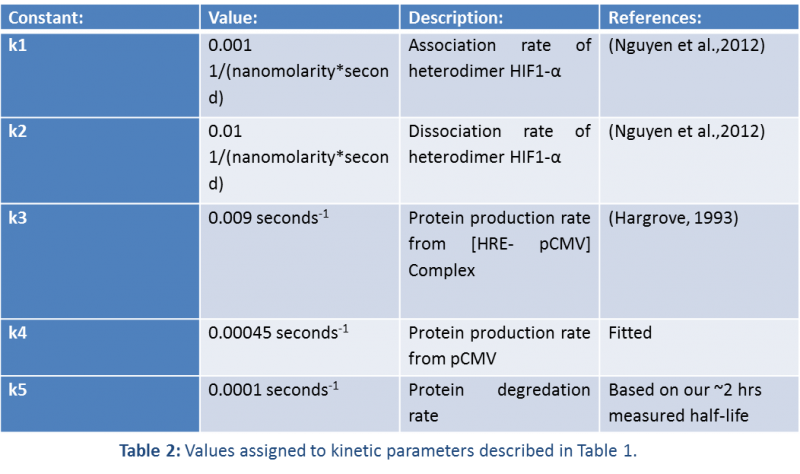 Before running the model, we had to decide on how the hypoxia response element affects gene expression The pCMV promoter (distincted from HRE) expressed approximately 0.15 nM and the [HRE- pCMV] complex expressed 1.86 nM of luciferase in 12 hours. In our simulations, we show that adding hypoxia response element in our promoter design increases the protein expression approximately 20 times more in hypoxic conditions. This data was then used to design an experiment that could be performed in the lab to verify the model. You can visit our results page to see the comparison. The main goal of this part, being sensitive of TetR – VP16 system to hypoxia. In order to achieve this, ODD added between TetR and VP16 components.In this way, TetR-ODD-VP16 complex can only initiate the transcription of only weak promoter in hypoxic conditions because of the degradation of the complex by proteasome in oxygen presence. By using this system, we created a novel true/ false mechanism which triggers protein synthesis dependent on oxygen by modifying that has already present pTRE-Tet Off system. In order to realize how our system will work. 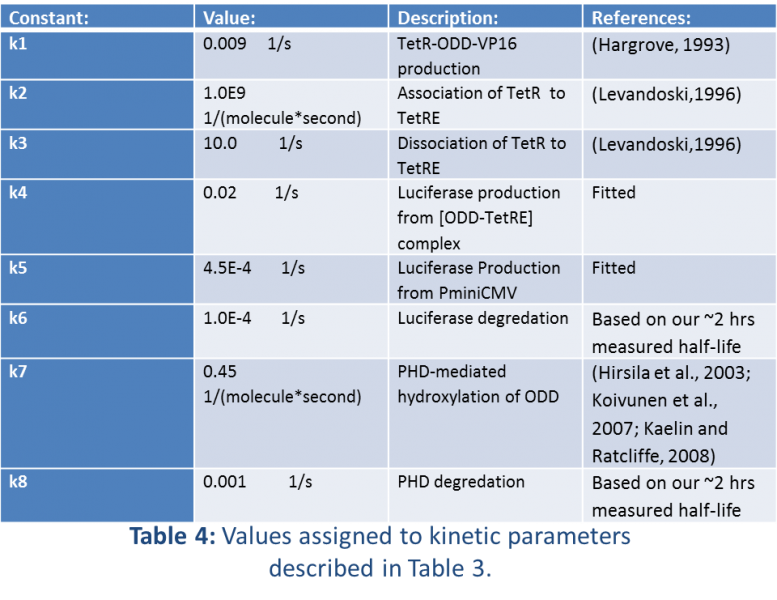 We try to calculate how the protein synthesis will effect under different concentration of O2 at the TetR - ODD - VP16 system. Using the SimBiology toolbox for Matlab we created a framework of the pTRE-Tet Off System (Figure 2). 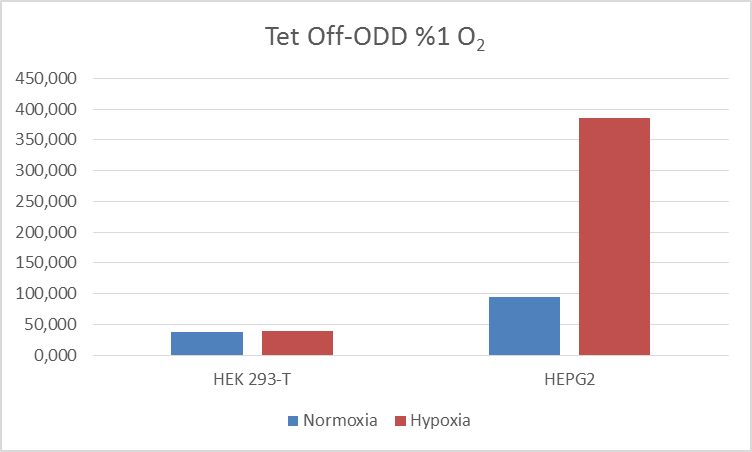 After modified the TetR-VP16 system by adding ODD, we try to realize how our designed sytem will work under hypoxic and normoxic conditions. In normoxic condition, PDH is activated and hydroxylated the TetR-ODD-VP16 system, luciferase expression decreases. In our model approach, we showed that luciferase expression increased %10 after exposed to 1nM O2 compared to 100 nM O2 concentration. We reached expected result in wet lab for HEK293 cell line. However, after we used HEPG2 cell line for this system, we had more reliable result about hydroxylation of ODD. The reason of this can be about life time of cells under hypoxia, because it will affect amount of PHD that enter nucleus during normoxia /hypoxia. Firstly, we built a model to help understand the gene expression dynamics of the whole circuit. In our promoter design, we added NFKB response element to upstream of the gene. During reperfusion, ROS increases. We assumed that this situation triggers the import of NFKB from cytoplasm to nucleus. Then, NF-kB integrates with compatible kB-RE sites in order to initiate transcription. We try to understand how this system effect of protein synthesis. Then we wrote down the four chemical reactions in represent of each process. Using the SimBiology toolbox for Matlab we created a framework of the NFKB system (Figure 1). 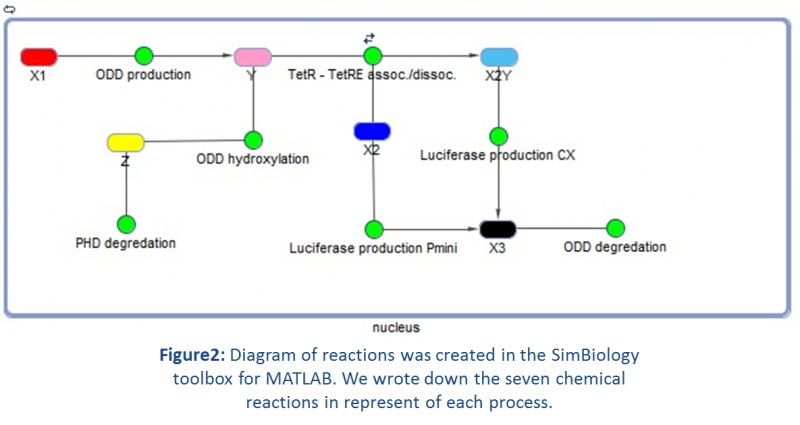 (Figure 1:)Diagram of reactions was created in the SimBiology toolbox for MATLAB. The effect of increasing ROS concentration on NFKB-KBRE association was changed and this situation triggers the import of NFKB from cytoplasm to nucleus. Therefore, protein expression of increases 2 times during reperfusion. In the experimental results showed that adding H2O2 to HEK293 cells induced protein expression 2 times. Also, this result verify with modeling that designed the situation in reperfusion injury.